When considering what to do about removing a trip hazard, many people look for concrete sidewalk repair near me. The choices in sidewalk trip hazard repair companies are, fortunately, more plentiful than ever. This is great news to many business and property management groups who are looking for a cost-effective and convenient way to repair trip hazards. Florida Sidewalk Solutions is one such sidewalk trip hazard repair company servicing the South Florida region. We specialize in removing trip hazards in order to ensure ADA compliance and, ultimately, improve safety. Read more about our sidewalk trip hazard repair service below as well as why we are South Florida’s best option for anyone searching concrete sidewalk repair near me. Trip hazards are public dangers. They make it difficult for many people walking on sidewalks and walkways, especially for individuals that already have limitations. The Americans with Disabilities Act of 1990 (ADA) determines any raised surface on a public sidewalk that is greater than one-quarter inch as a trip hazard. The reason this determination is significant is that the people who own or manage the sidewalk where the trip hazard is present are the ones who are responsible for ensuring its safety. In other words, a trip hazard presents a potential liability and ignoring them can lead to legal action resulting in hefty financial settlements. The methods for sidewalk trip hazard repair are namely concrete cutting, concrete grinding, and full sidewalk replacement. As most businesses and property management groups understand, full sidewalk replacement is a significant burden. Not only is sidewalk replacement extremely costly, but it is also highly disruptive and time-consuming. Fortunately, modern trip hazard removal methods eliminate most of these problems. Both concrete grinding and concrete cutting are fast and affordable. The reason concrete cutting is preferred to concrete grinding, however, is guaranteed ADA compliance. Whereas concrete grinders have situational limitations and unpleasant aesthetic results, concrete cutting is able to reach all corners of sidewalk panels without damaging nearby objects in an aesthetically pleasing, slip-resistant surface. If you’ve been searching for concrete sidewalk repair near me and are located in the South Florida area, contact our specialists. Florida Sidewalk Solutions has successfully removed thousands of trip hazards for property management groups, businesses, and municipalities. 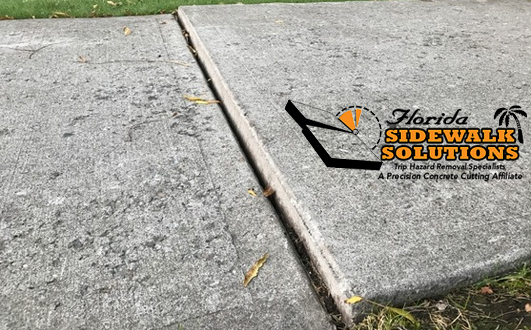 Contact us to get a free estimate for the cost of our sidewalk trip hazard repair service and learn why we continue to earn recognition as the best sidewalk repair company in Florida. Don’t bother with the hassle of sidewalk replacement. Keep the sidewalk, remove the liability!